The Shed — New York City’s new, $475 million arts center “dedicated to commissioning, developing, and presenting original works of art, across all disciplines, for all audiences” — opens to the public today with the world premiere of “Soundtrack of America.” The five-night concert series, conceived and directed by Steve McQueen with a creative team led by Quincy Jones and Maureen Mahon (also including Jay-Z/Kanye West producer Dion “No I.D.” Wilson, RCA EVP Tunji Balogun and veteran keyboardist/producer Greg Phillinganes), celebrates the impact of African American music on contemporary culture with performances by a new generation of artists. The opening commissions continue on April 6 with new work by artist Trisha Donnelly and the world premiere of “Reich Richter Pärt,” an immersive live performance installation from artists Steve Reich, Gerhard Richter, and Arvo Pärt. The world premiere of “Norma Jeane Baker of Troy,” a specially commissioned spoken and sung dramatic work by poet and scholar Anne Carson, starring Ben Whishaw and Renée Fleming and directed by Katie Mitchell, will be performed on April 9 (with previews on April 6 and 7). Scheduled for later in the Spring are elaborate projects featuring Bjork, “Sorry to Bother You” director Boots Riley and many others — head here for a complete schedule. 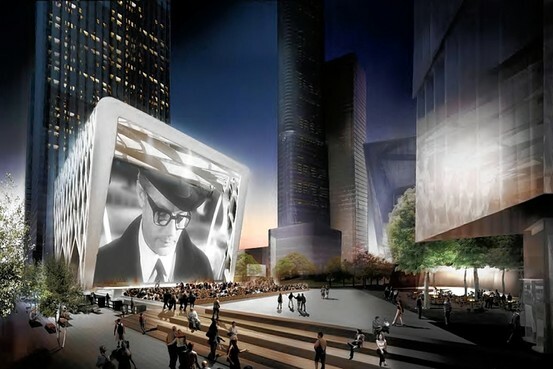 It’s an ambitious opening slate for a monumentally ambitious project — a gigantic arts center in the city’s new, skyscraper-dominated neighborhood of Hudson Yards. In development for more than a decade, The Shed is a nonprofit cultural institution located a movable, adaptable structure that includes two floors of expansive galleries, a 500-seat theater, and The McCourt, a multiuse hall for large-scale performances, installations, and events for audiences ranging from 1,250 seated to more than 2,000 standing. A rehearsal space, lab for local artists, and event space are located in The Tisch Skylights on the top floor. Media previews of the space and a couple of the forthcoming projects earlier this week, were both state-of-the-art and artistically challenging. The venue’s main performance spaces are intimate and acoustically precise, but the floor-to-ceiling glass in many of the hallways and escalator banks provide stunning views of the city’s west side and across the Hudson River (not to mention the much-maligned new viewing platform, the Vessel). The McCourt has not only a large stage and seating area, there is another a bleacher-style viewing area containing a couple hundred seats a floor above, enclosed in the front by floor-to-ceiling glass that overlooks the McCourt. The rehearsal space on the top floor has floor-to-ceiling walls on two sides as well as its titular skylight, making for a sun-kissed performance area. Another interior theater has a large stage essentially built into the wall, making for an unusually contained performance space — a press preview of “Norma Jeane Baker of Troy” took place in this theater (pictured below). 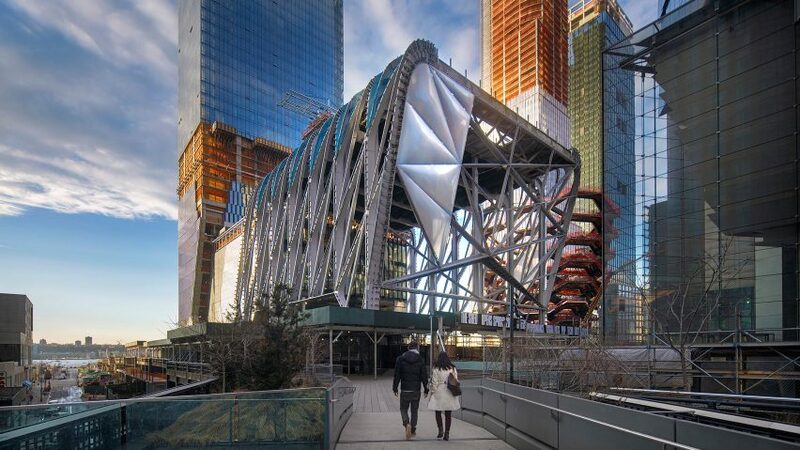 Thus far, The Shed has raised $529 million toward its capital campaign goal of $550 million, which includes building costs, organizational start-up expenses, and support for the creation of new work.